Brassia Orchids are a warm to cool climate orchid sometimes referred to as Spider Orchids. spider orchids. Although they do not like very cold conditions they will thrive in cool climates as long as the temperature does not drop below 10 C for extended periods. These are a fragrant orchid, spider like extensions on the petals give the orchid its common name. With over 40 species and an ever increasing number of cultivars for sale you can be spolit for choice. 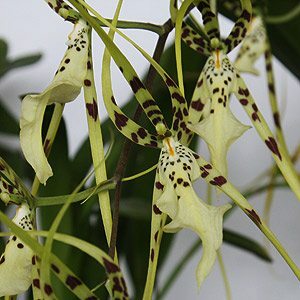 However it is difficult to go past species such as Brassia verrucosa which is pictures right. Others such as Brassia lomgissima are also worth considering. Hybrids such as the popular Brassia Rex group with the trademark green to yellow flowers marked with brown are also popular. Brassia Rex is more tolerant of heeat than others. Spotless forms are also available. Although they are from South America they are from higher elevations and fare epiphytic, growing on trees in forested areas. In culture they are usually mounted on tree fern, cork or coir. They can also be grown in containers in a free draining pine bark medium. The main aspects of general care foy Brassia Orchids are are light, moisture and fertiliser. The growing season is from spring to early autumn and during this period a liquid fertilizer applied every 2 – 3 weeks as part of the watering regime will help them thrive. In between applications of fertiliser water well until the water runs through the pot. This will help flush away the excess salts from fertiliser. Use a 50% solution rather than full strength with these frequent applicatio ns. As autumn comes to an end reduce watering almost completely. Allow the potting mix to dry out between waiting and hold off with fertiliser. Light needs to be strong but filtered, Brassia orchids do not like strong direct sun at any time. Increased humidity may be required indoors, use a tray of pebbles with water beneath the pot to increase humidity. Do not sit the pot itself in water.